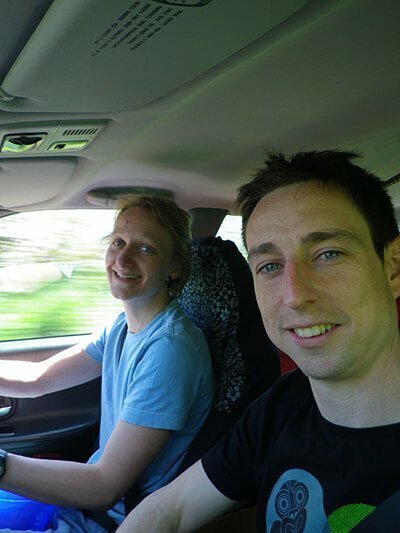 Skomer island sea kayaking with Marine life, Seals and Puffins! 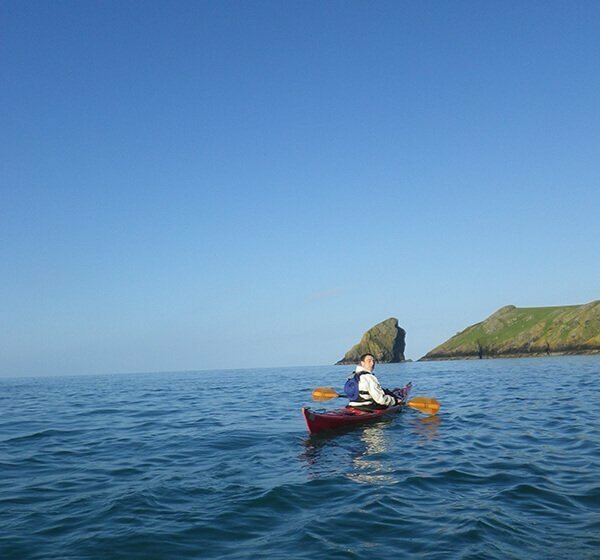 Skomer Island Kayaking trip in Pembrokeshire, Wales. Skomer is well known for its wildlife: a third of the world population of Manx Shearwaters nest on the island, the Atlantic Puffin colony is the largest in southern Britain. 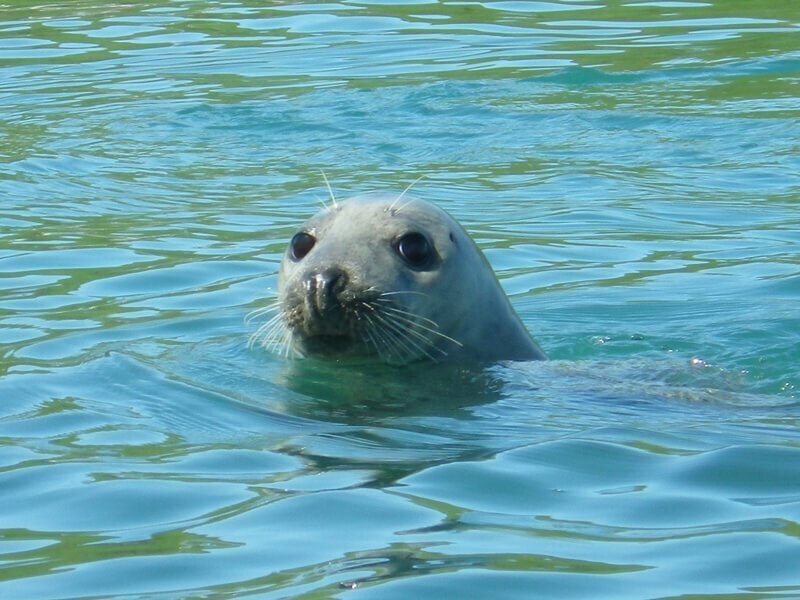 Travelling to Skomer Island at 5 am start gave us stunning light, calm seas and playful seals..
Our day out started with breakfast from Tupperware tubs and ended with seals hugging our kayaks. We left Martins Haven as the sun was rising with glassy calm, swimming pool like water and open sea ahead of us. Not surprisingly we were in high spirits and were very excited to see what Skomer had to offer on such a stunning May day…..
Jack Sound is a treacherous body of water about 800 metres (2,600 ft) wide between the island of Skomer and the Pembrokeshire mainland that contains numerous reefs and a tidal race of up to 6 knots. It is used by boats to avoid a three-mile detour around the island and has its share of sunken shipwrecks. The island and the sound are both parts of the Skomer Marine Nature Reserve. Just look how playful they were. Swimming alongside us so close we had to be careful not to hit her with our paddles. At one point Libby said to me “my boat feels heavy”. I looked under her boat to see that this seal was hugging the hull of her kayak and by the look of things thoroughly enjoying the ride. 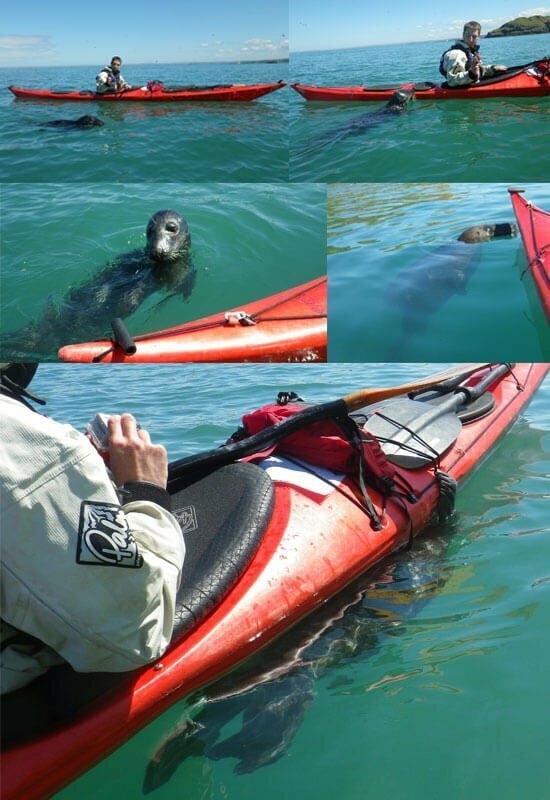 We stopped at this point and the seal then tried to get up onto my kayak. I stayed calm as she was clearly just having fun with this big red toy. 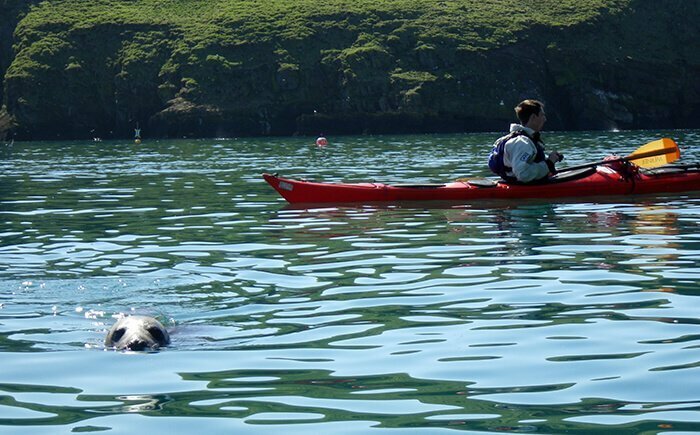 We paddle around Skomer at least once a year to enjoy the wildlife but it was a surprise to both of us to have such a close encounter with the incredibly friendly Atlantic Grey Seals…..
Kayak-King never approaches wildlife – we let it come to us. For advice on Wildlife spotting without causing disturbances visit the Pembrokeshire marine code website.